While training your dog, it's important to spend time teaching your dog certain actions. These are called "cues" or "commands." There are several basic dog training commands that every dog should know. These cues can help you keep your dog under control and give your dog a sense of structure and order. They can also help you manage a variety of common behavior problems. In some cases, a well-placed command word may even save your dog's life. One of the most important aspects of training a dog is making sure his attention stays on you. Teach your dog the look or watch me command so you can always get your dog to focus on you, no matter what distractions are present. Use of this cue comes in very handy when teaching your dog other commands. The emergency recall ensures that your dog will come running when you call in any and every situation. It is used only in emergency situations, like when your dog is about to run in front of a moving car. Training a dog to come in an emergency may save his life. This is a different command than the simple recall, often called the come command. The come command, or recall, can save you from a lot of aggravation and frustration. You can use it to get your dog to come if he slips out of his leash, to get him to come quickly inside from the yard, or to come over for some cuddle or play time. Be sure only ask your dog to come to you for good things. This way, he will always be happy to come on cue. Practice this frequently throughout your dog's life, rewarding compliance with praise and treats when available. With me is a dog training command used to keep your dog from pulling on the leash. This means your dog is walking in pace with you in a relaxed manner. 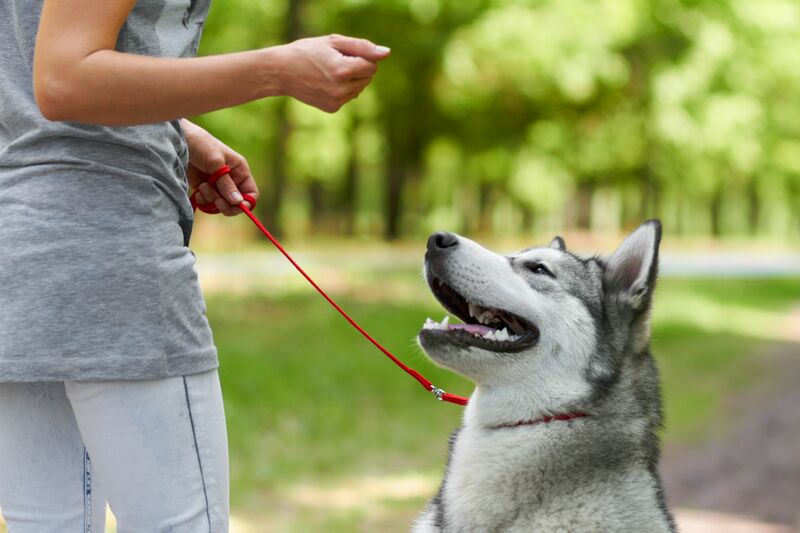 A loose leash makes walking your dog much more fun and makes it more likely you'll get your dog out for the ​exercise and socialization he needs. You can use any word or phrase to mean the same thing. Instead of saying "with me," some people use the command "easy," or "no pull." Choose something easy for you to remember and simple enough for your dog to understand. Leave it is the basic dog training command you use to tell your dog not to pick up something he's approaching. It can prevent him from eating something harmful, or help you to save your favorite pair of shoes from being chewed. This cue is best used when you spot something that may interest your dog, but your dog has not picked it up yet. If your dog picks up something before you can say "leave it," then the command drop it can protect him from accidentally ingesting dangerous things. Training a dog to drop it means that he will let go of anything he's picked up in his mouth. Like the leave it command, drop it can save your dog from ingesting anything that is poisonous or may cause injury. It can also keep him from chewing up your possessions as long as you are around to catch him. Practice this frequently, replacing what you took from your dogs mouth with something very rewarding, like a toy or delicious treat. The sit command is usually the first command people teach their dogs. It seems pretty basic, but it can play an important role in managing unwanted behaviors. For instance, a dog can't sit and jump at the same time. 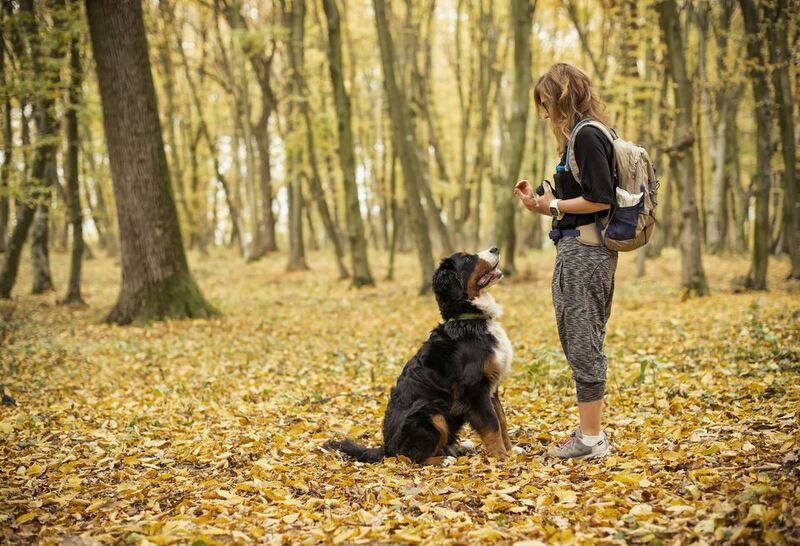 By training your dog to sit, you've begun the work needed to prevent him from jumping. In addition, training your dog to sit can help him settle down and relax when needed. The lie down command is important for several reasons. First, just like the sit command, it's incompatible with certain unwanted behaviors. A dog can't jump up and surf counters while he's lying down. By teaching him to lie down on command, you have a tool to manage a number of common behavior problems. It also promotes relaxation for excited dogs. Lie down serves as the building block for a number of other behaviors. For instance, before you can train a dog to roll over or go to his place, he needs to know how to lie down. The stay command is useful in a number of situations. It can keep your dog out from under your feet, or it can save his life by preventing him from running into dangerous situations. If your dog knows how to stay on cue, you can manage his behavior well in public and private. It may also allow you to let your dog off the leash in certain situations when he must stay still. When you give your dog the wait command, it tells him that he can't move forward until you give him the okay. It is perfect for keeping a dog from bolting out of a door, his crate, or the car. Wait tells your dog something he wants is coming, but he has to be still to get it. This cue is similar to stay but gives your dog a little more freedom while waiting.